Holes has been a unit my daughter had her eyes on, since we started with the 8-10 level. I had again never read the book, and could not quite imagine what story was waiting for us. The geology, the science part that goes along with this unit looked very promising and fun as well. It comes with its special little science kit and you will do multiple tests, labs, experiments throughout this unit. Once again we had many opportunities to all work on things together, her little 5-year-old sister had plenty of moments to observe along with her, go on a rock hunt and big sister even let her help discover the skeleton of the T- Rex. Our geology studies were great fun throughout this unit. We started with cookie mining ! We learnt lots about rocks and minerals and another activity that surprised me as being fun, was reading through all the labels in our pantry ! She sat there for multiple hours and dug through the whole, entire pantry !! She was amazed about what we are eating and shares her facts with us nearly daily now ! 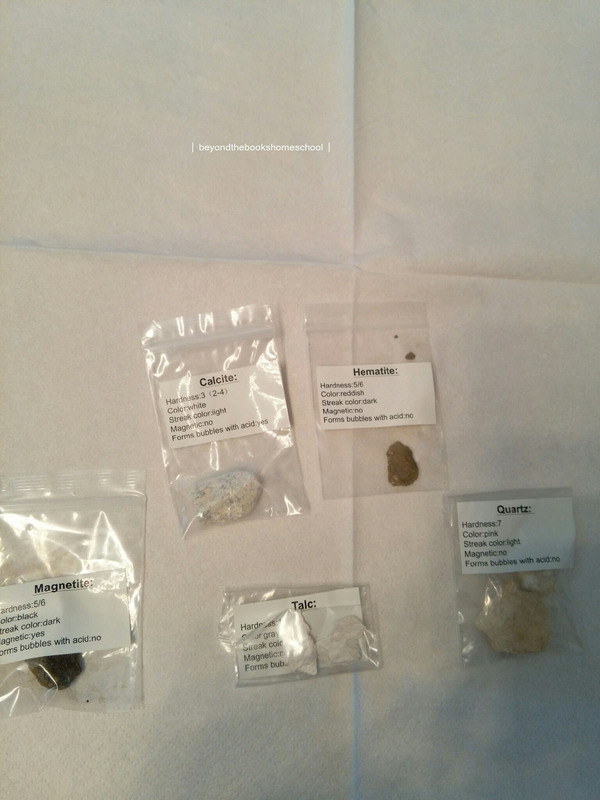 Above are some of the rocks and minerals that come with the science kit. I would loved it to be even more rocks, even though we already had some from other kits we still wished for more to just really be able to do the experiments better and have a wider variety. I found some great rock kits on amazon and I will be ordering some for her birthday in the summer. She had such great fun with this unit that I know she will be happy to pick it back up again. This is an amazing series of books, which we have gotten from the library. It is fun and brings science to life ! Overall there are many great kits available on amazon. I will update this after I have chosen another one and we have tested it. For now it looks like I will be ordering another one of these. Of course we also got to break our geode. She was a little disappointed to see how little the geode was and the size also made it harder to actually break it. Again, I plan on buying a few more to let her try it again and maybe get a better chance at finding a colored one. Ours was white, and still very beautiful. We had multiple activities that called for lots of outdoor time. Unfortunately our weather her in Texas has been very awkward for our state lately and we have had rain, rain and more rain. We still ventured out a few times and had a great time collecting and hunting for rocks. Our great exploration to an actual Fossil park will have to wait until better weather though. Some of our crystal experiments did not work this time, but we got some amazing sugar crystals ! Working on different fossil types. We learnt about imprint, cast and mold fossils ! This was the T-Rex dig !! It was a lot of fun for them, the spent two days outside just working away on it ! We love the variety of activities throughout Moving beyond the page. You really learn in so many ways. 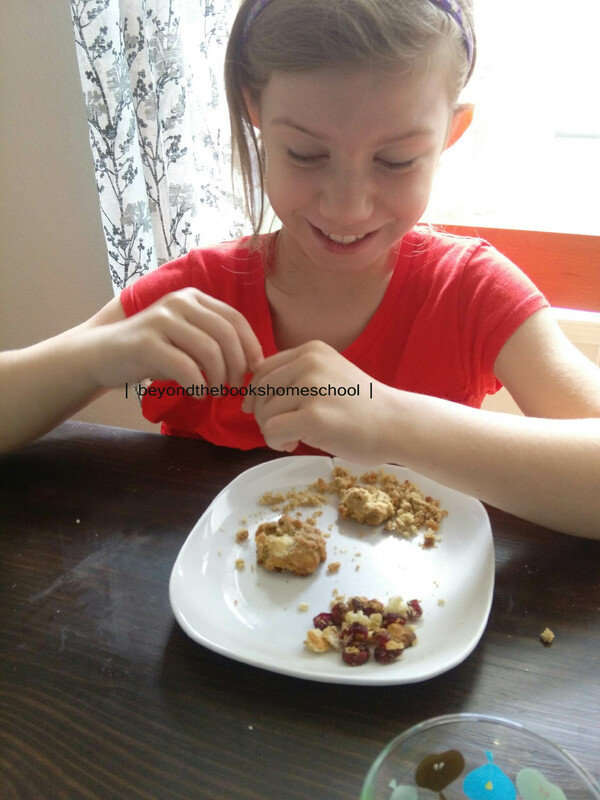 Cooking is a favorite of my daughters and she loves learning about culture, history and food al at the same time. Here we made Katherine Barlow’s famous spiced peaches !! So as you can see, this Unit kept us very busy ! I didn’t feel like it was a very difficult unit, and it was fun and easy to go through and along with all the activities. Sometimes some units feel like they have an intense work load, or just way too much to read. But the chapters in HOLES are short and sweet and easy to read. My daughter actually finished the book on her own at some point, because she was too excited and just could not wait. The Geology rocks is a wonderful book, that will be kept in the library for a very, very long time. Many more experiments that can be done at a later point, just for fun ! So if you are curious about this level of Moving beyond the page, the Unit HOLES and the Geology can be found in the 8-10 level here. You can buy them both separately and both can be done independently but they are so much fun together ! The last few weeks have been a little hard. From left and right things happened that threw me of course. Some rather not so happy news back from the home front in Germany ( but with a good, positive outlook !! ) , and then last week some very sad news from my husbands old work about a co-worker. Some things really can throw you of course, and when you have to deal with them nearly by yourself it is hard to find even just the time to deal with it… to think clearly… Luckily me and my husband always find time to talk and it has made us so much stronger in the past. Positive thinking gets me through these days and it has changed my daily life. I try not to be grumpy about the little things, and try to smile more. Life is a blessing and if we don’t cherish it, it will be over in a second. The news from my husbands former work, hit us really hard. He used to work in a EMS rescue service, making sure their helicopters are ready at any minute when they are needed. He worked with pilots and nurses, and when we heard that they lost an amazing, wonderful team member and friend, last week during a rescue mission it was just heartbreaking. Back then I knew how important their job was of course, but it was never as obvious as it is now. I couldn’t see his pride in working for them and with them back then, even though I knew it was there. We changed locations and jobs, and some days I am not sure it was the right decision. The selfless work they do on a daily base is overwhelming and I know my husband misses this selfless work rather than just meeting other goals for a company. He amazes me and makes me a stronger woman, mother and wife. His old work, was more than just work. Homeschooling can be tough when your mind is blank. I wanted to think of other things this week than geology, Math and the other books we are currently reading, but keeping busy also helped me move on. You can’t dread about things too much. Every little happening in life shapes us. For the longest time now I have been interested in the psychology field of happiness. Honestly, if I could go back to college Psychology is what I would love to study. It amazes me on so many levels. I think selflessness and a meaningful life is a wonderful way to happiness. As much as I hated these past lessons of life, I appreciate them. I learnt. I will try to live better. I will try to appreciate the little things more.Share more. Smile more. And be more selfless.